Instead of grinding the food waste and wasting precious freshwater for flushing, the strainer-drawer in GDRU strains solid particles under the pre-rinse sink when dirty dishes are being pre-rinsed, affecting a much needed pretreatment process of restaurant wastewater. To ensure the food waste is not flushed down your drains, install our GDRU to catch any solid waste before it enters the piping system and grease trap/interceptor. 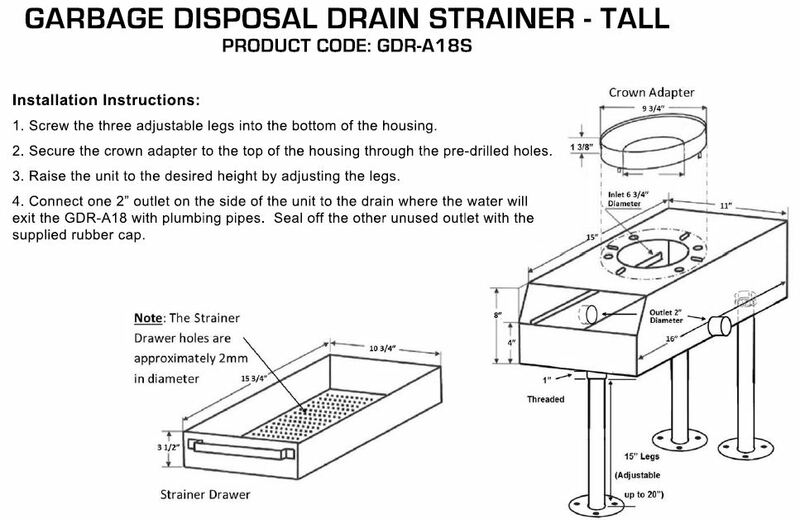 This will help to eliminate the backflows and the foul grease trap/interceptor odors. • Saves money on water & electricity. • No moving parts to maintain. • Durable stainless steel construction. • Keeps grease trap/interceptor cleaner and lowers maintenance frequency. • Encouraged by local governments and Water Districts. Features outlets on LEFT and RIGHT side. Legs are 15" long, and are adjustable up to 21"
Three legs to make it easier to clean floors under the unit. It is recommended to use our pre-rinse basket whether your sink is round bowl, square or cone shape in conjunction with the GDRU. A pre-rinse basket can function as the first stage strainer catching big pieces of food waste above the sink. With 2.5mm holes in its strainer-drawer, GDRU functions as the second stage strainer catching very small particles maximizing the effectiveness of the process.